Redirection - a 301 is a permanent redirection - it indicates that this page no longer exists and it can point to a replacement page. A 302 is a temporary redirection - this page is temporarily unavailable - and usually directs to another page, eg home page, on the site. When a page is no longer required to be active, but has been actively searched and indexed by google and other search engines, the url that will be inactive needs to be redirected to a suitable alternative page. The benefit of this is that you do not lose people who have found your site through a search term that interested them, and while you cannot serve the old page, you can point them to something potentially useful. For example, your '301-s' page might not be winning you many page views, so you create a new url for it 'best-301-redirection-in-leap' and point your old page to this new one by loading both the original value, and the destination value in the Site / SEO / Old URLs table. 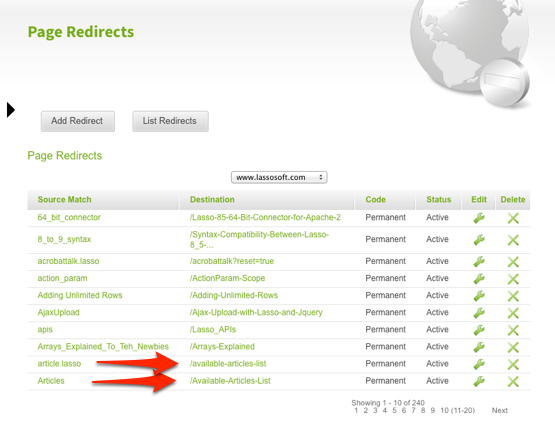 In the example shown in the figure below, both 'article.lasso' and 'Articles' have been redirected to 'available-articles-list'.